JNN 26 June 2015 Sau Paulo : With the start of the holy month of Ramadan, Latinos are noticing that a significant number of their neighbors have started observing fasting and other Islamic rituals pertaining to Ramadan, Latin Times reported. Hispanic Americans are slowly but increasingly converting to Islam, growing Muslim populations in Latino-heavy regions like California. Muslims celebrating Ramadan in Central and South America include both Muslim immigrants and a small number of converts. 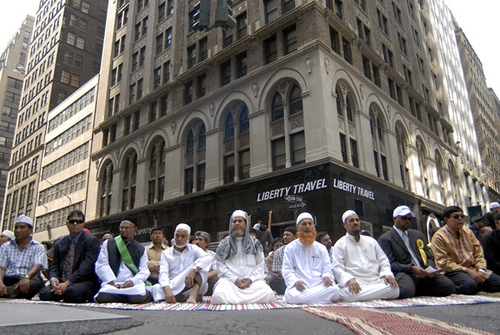 The United States, Canada, Argentina, Brazil and Mexico have the largest Muslim populations in the Americas. The Arab diaspora (including those who are not Muslim) claim significantly large communities across Latin America. Significant numbers of Lebanon, Syria and Palestine immigrants have populated in Mexico, Colombia and Brazil. Muslim immigrants and new converts are helping the religion grow. There are probably many explain the growing number of Hispanic Muslims in the U.S., from a cultural history or a general migration away from Catholicism. In the U.S., most Hispanic Muslim converts say that they were looking for a change. “I realized I didn’t like the idea of a gate keeper,” Mark Gonzalez, a Muslim convert who was raised Catholic told the Huffington Post in 2012. How do the numbers break down by country? Muslims account for between one percent and two percent of the population in Argentina and Canada, according to a Pew study from 2009. In other Spanish, English and Portuguese-Speaking countries they account for less than one percent, except for those Caribbean countries with majority Afro populations like Surinam and Trinidad and Tobago. 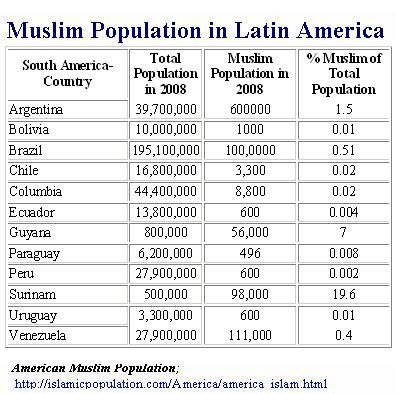 Here are the five countries with the highest number of Muslim population in Latin America, in addition to the Unites States and Canada: The United States, Argentina, Canada, Brazil, Mexico, Venezuela and Suriname. This entry was posted in America and tagged Central and South America, converting to Islam, Latin America, Latino, Muslim convert, muslim converts, muslim immigrants, Muslim populations, Muslims, ramzan. Bookmark the permalink.